Fox Tail Millet / Thinai is one of my recent favorite grain and i am including it in my diet weekly twice or thrice. I replace white rice with brown rice, oats, millet, cracked wheat and completely skip white rice. Generally Millets(Kambu, Ragi, Solam, Thinai, Samai) are a natural source of protein and iron. Millet is very easy to digest, it contains a high amount of lecithin and is excellent for strengthening the nervous system. Millets are also rich in B vitamins, especially niacin, B6 and folic acid, as well as the minerals calcium, iron, potassium, magnesium and zinc. Millets contain no gluten, they are good for people who are gluten-intolerant. And the most important factor, regular consumption of Millets reduce the risk of type 2 diabetes because millets are rich in magnesium, which regulates secretion of glucose and insulin. Pearl Onions/Chinna Vengayam 10 no. First Wash and soak Fox Tail millet/thinai with enough water and keep aside. Then Pressure cook dal with 1 cup of water, garlic and 1/4 tsp turmeric powder for 4-5 whistles, wait till pressure cools down and then open the lid and mash it well and keep aside. Wash and chop veggies, onion and tomato and keep ready. Then heat a pan, add few drops oil heat it and then add chana dal, dry red chilli, coriander seeds and fry in medium heat till dal turns light golden brown. And roast dry coconut separately and keep aside. Now heat oil in a pressure cooker, when its heated add pearl onions and curry leaves and saute it for a minute. Then add chopped tomatoes and saute till it turns mushy. After that add chopped veggies and stir fry for a minute and then add mashed dal and 1 cup of water and bring it to boil. Once it starts boiling add tamarind extract, enough salt and stir well. Then add soaked and drained millet/thinai and sambar powder and 1/4 cup water, stir everything well and pressure cook for 2 whistles. And wait till the pressure cools down, meanwhile heat oil in a pan and then add mustard seeds wait till it pop and add cumin, fennel seeds let it fry. 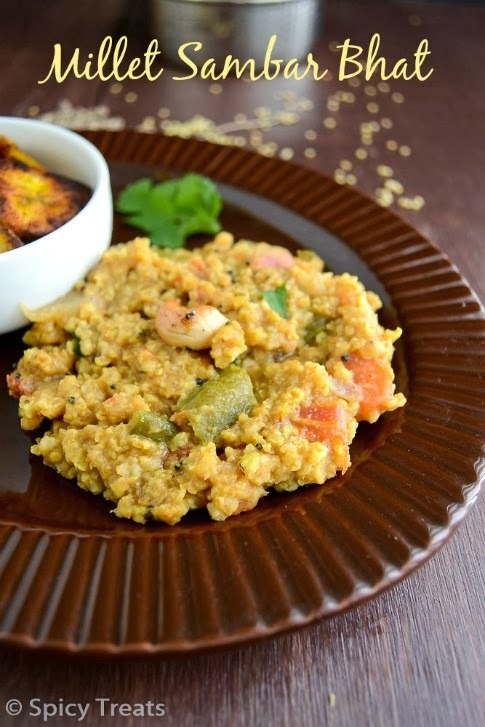 Then add hing, curry leaves and cashew nuts fry well and add this tempering to the cooked Millet Sambar Bhat. That's it...Tasty Millet Sambar Sadham ready. Garnish with cilantro. The same way instead of thinai, you can use Quinoa, white rice or brown rice. For brown rice use extra 1/2 - 3/4 cup of water. I used freshly roasted and ground powder, you can also use Sambar Powder. 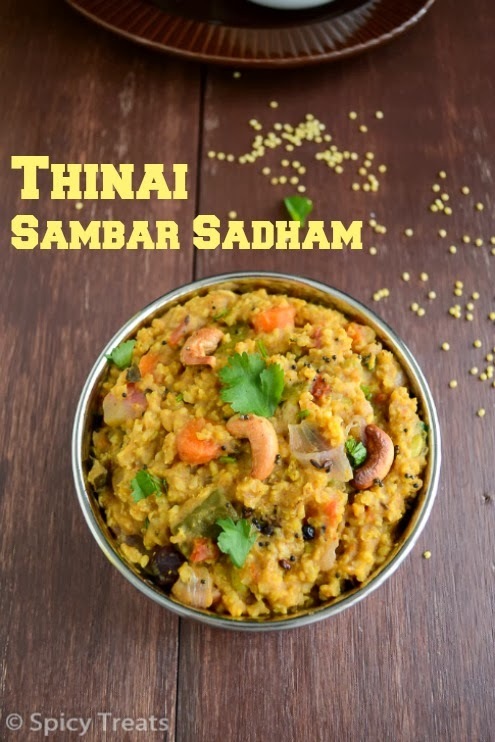 Very Healthy and delicious sambar sadam using thinai. 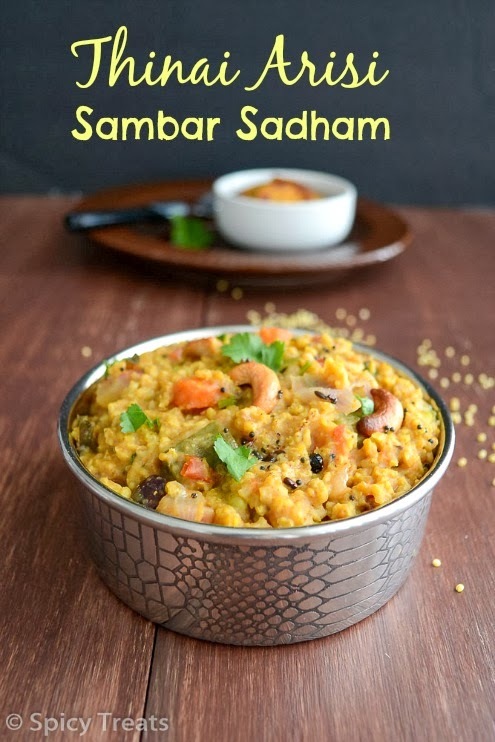 Healthy sambar sadham, looks delicious too..
tis s jus awesome.. i love millets replaced by rice..
Looks like our normal rice sambar sadam. Kids and adults who hate millets can eat this without any constraint. Trust me, this is one of my family favourite one pot meal since few months, loving that bowl Sangee.. Very inviting sambhar rice.Love to take it as it is. 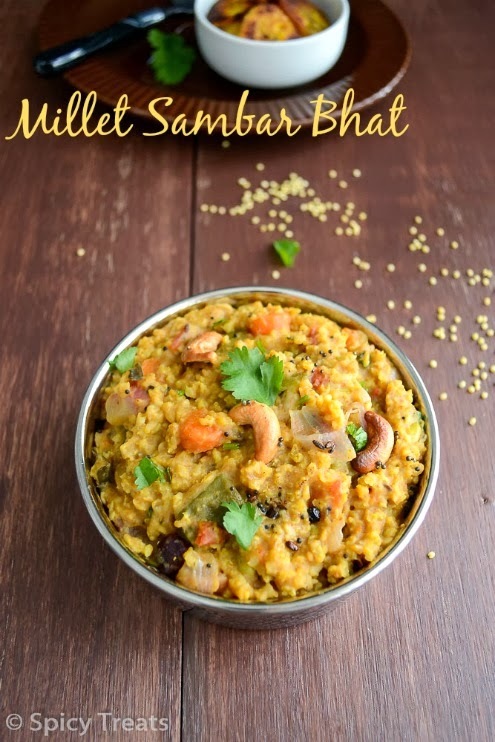 Super Sangee, even I have started cooking with millets, the thinai sambar saadam looks delicious..
Wow nice recipe.I really love any kind of sambar. 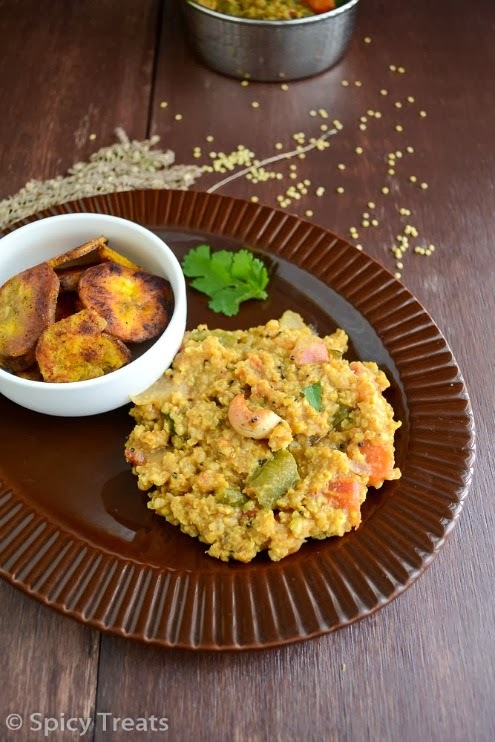 I am pregnant I was searching for some different yet healthy recipe to eat and finally found this one and made it.. it came out very well and very tasty too .. thanks much for sharing this recipe ..
Congrats Abarnaa! Happy that you liked my recipe...thanks for your feedback. TC!